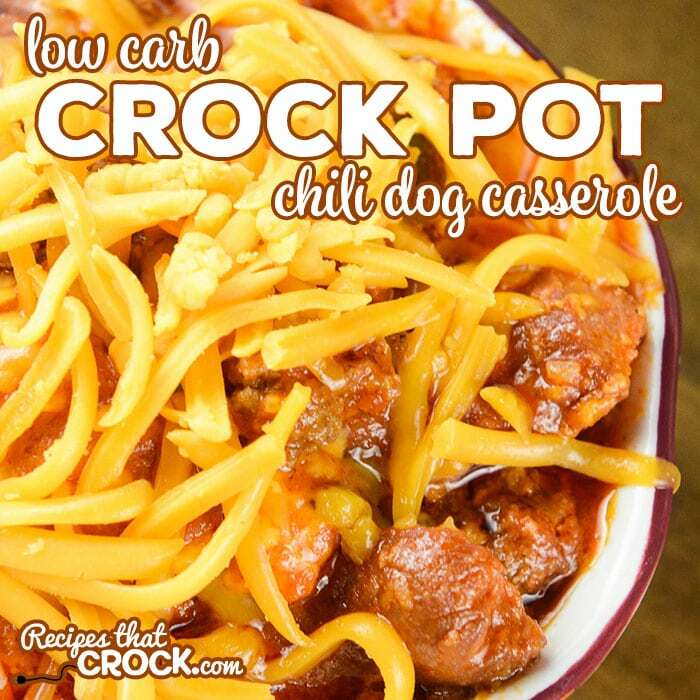 Crock Pot Chili Dog Casserole (Low Carb) - Recipes That Crock! Do you love chili dogs? 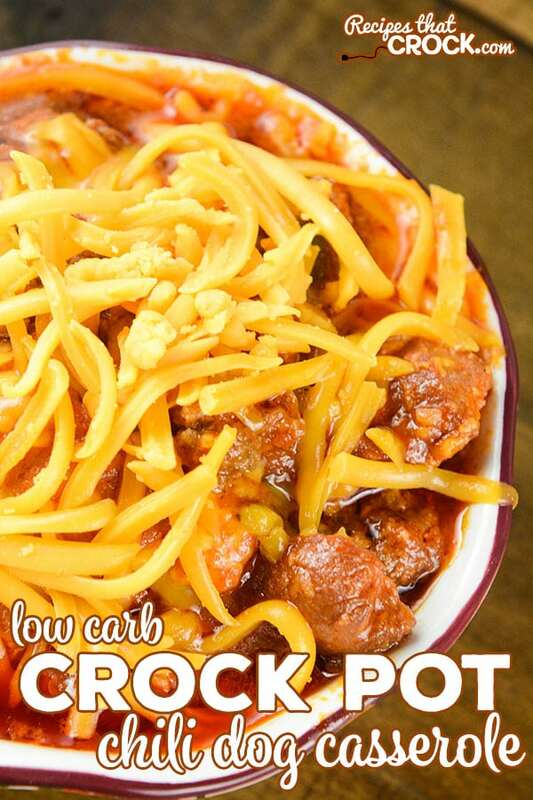 Our Crock Pot Chili Dog Casserole is a delicious alternative to your favorite fast food option AND it is low carb! Mikey just LOVES chili dogs and specifically Dairy Queen chili dogs. 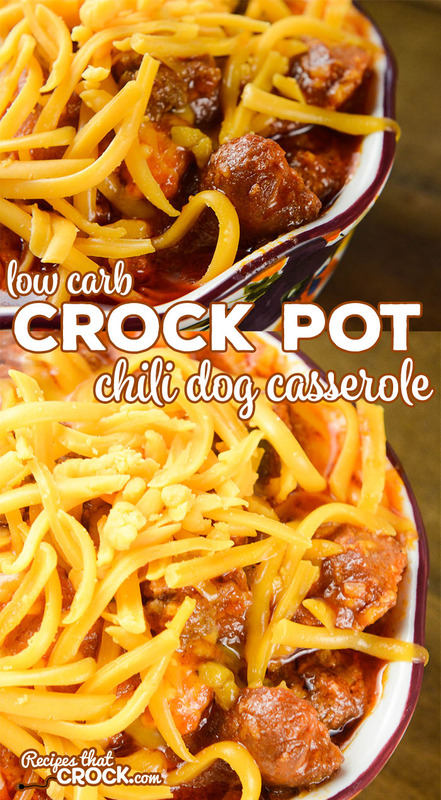 So when I was flipping through one of my new low carb cookbooks, Keto Comfort Foods and saw a Chili Dog Casserole, I was totally inspired to make a slow cooker version. Making Crock Pot Chili Dog Casserole is super simple. You just brown your beef with your garlic, onion and peppers in a browning slow cooker or in a skillet on the stove top and season with salt and pepper. Then you combine this mixture with your marinara sauce, seasonings and broth in the slow cooker. Top with hot dogs and cheese and cook on high for 2 hours or low for 4. Stir before serving and top with additional cheese as desired. This recipe was inspired by and adapted from a recipe found in a great cookbook called Keto Comfort Foods. We like to use our Ninja Slow Cooker to brown the ground beef in the unit before slow cooking but you can use any 6 quart slow cooker if you want to brown your ground beef on the stove before slow cooking (or you could use our Make Ahead Ground Beef). Mikey likes to make ours a little spicier by substituting cayenne pepper for the chili powder. If you are serving kiddos, you might choose the chili powder instead. We used our favorite low carb marinara sauce, however it is expensive. Feel free to use the marinara sauce of your choice. However, if you are eating low carb, make sure to check and compare labels carefully. Tomato products can vary GREATLY in carb counts. We love the flavor of Ball Park’s Angus Franks in this dish. Feel free to use your favorite hot dog. If you are not eating low carb, consider serving this open faced on buns or even garlic bread. Brown ground beef with garlic, onion, bell pepper, salt and pepper in a browning slow cooker or in a skillet on the stove. Stir in marinara sauce, cumin, chili powder/cayenne and broth and if using a skillet pour into a 6 quart slow cooker. Evenly add hot dogs to the top of the mixture and cover with the cheese. Cook on High for 2 hours or Low for 4 hours. Stir before serving. Top with additional cheese as desired. We love the flavor of Ball Park's Angus Franks in this dish. Feel free to use your favorite hot dog. Made this Saturday and we loved it. I did use a real onion chopped and a green pepper chopped. Also used a low sodium marinara sauce. Lightly toasted some hoagie rolls and served this open faced on them. It is a keeper for sure! so what IS your favorite marinara sauce? ?